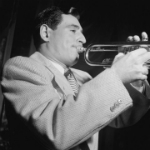 Ray Anthony (born January 20, 1922) is an American bandleader, trumpeter, songwriter and actor. He is the last surviving member of the Glenn Miller Orchestra. He played in Glenn Miller’s band from 1940–1942 and appeared in the Glenn Miller movie Sun Valley Serenade before joining the U.S. Navy during World War Two. After the war he formed his own group. The Ray Anthony Orchestra became very popular in the early 1950s, with “The Bunny Hop” and the “Hokey Pokey”, as well as the theme music from Dragnet. He had a #2 chart hit with a remake of the Glenn Miller tune, “At Last”, in 1952, the highest charting pop version of the song in the United States. In 1953, Anthony and his orchestra were featured when Helen O’Connell and Bob Eberly headlined a summer replacement program for Perry Como’s CBS television show. Ray Anthony’s compositions include “Thunderbird”, “The Bunny Hop”, “Trumpet Boogie”, “Big Band Boogie”, and “Mr. Anthony’s Boogie”.